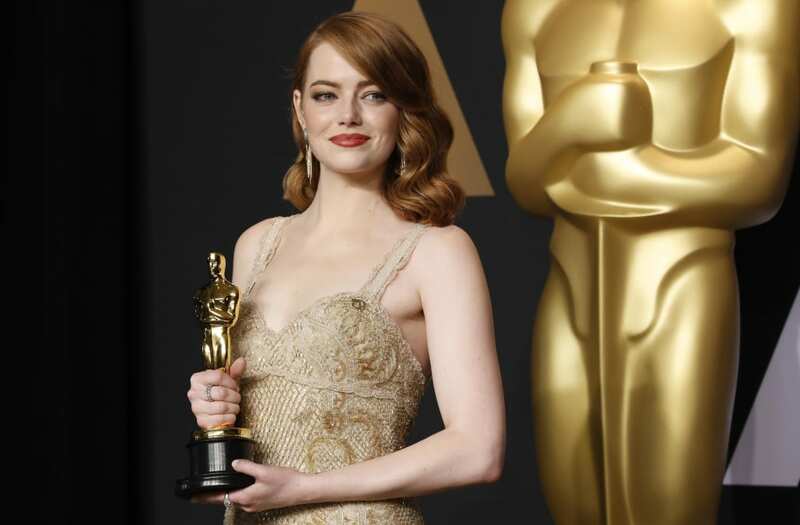 Emma Stone is adamant that it's going to take both men and women to help bridge the gender salary gap in Hollywood and beyond. The actress -- who covers the recent issue of OUT magazine with her co-star, Andrea Riseboroughis -- is currently promoting her upcoming movie Battle of the Sexes, which is the true story of the 1973 tennis match between Billie Jean King (Stone) and ex-champ and serial hustler Bobby Riggs (Steve Carell). During her chat with both Riseborough and King for the magazine, Stone claims that several of her lead male co-stars have taken pay cuts so they may have equal salaries. "In my career so far, I've needed my male co-stars to take a pay cut so that I may have parity with them," she explains. "And that's something they do for me because they feel it's what's right and fair." Stone says she's "grateful" to those men who have stood up in support of equal pay. "If my male co-star, who has a higher quote than me but believes we are equal, takes a pay cut so that I can match him, that changes my quote in the future and changes my life," the Oscar winner adds. "It's not about, 'Women are this and men are that.' It is, 'We are all the same, we are all equal, we all deserve the same respect and the same rights.'" The 28-year-old star also notes that there's still a long way to go in this fight, especially when compared to the sexism that King was facing in the '70s. "It still feels like we're in a bad dream, but those parallels make sense to me -- the equal-pay issue makes a lot of sense to me," she notes. "At our best right right now we're making 80 cents to the dollar." As for how she prepared for such an epic, athletic role in Battle of the Sexes, Stone reveals that she gained 15 pounds and played tennis six days a week. "I was really going for it," she says to King. "Your body was so iconic, and all I wanted was to just match that exactly. ...It's about the essence of Billie Jean and her heart and her spirit, but god, what I wouldn't give to have those same muscles. You have no idea." Battle of the Sexes hits theaters on Sept. 22. Here's a closer look at Stone's shocking transformation to portray the renowned tennis pro in the video above.